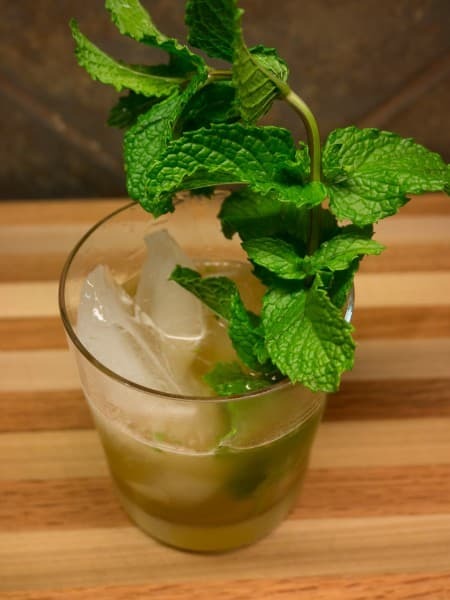 Leisurely shake everything except one sprig of mint with ice cubes. Strain onto new ice cubes in a glass. Garnish with the third sprig of mint. First, go easy with the shake. You don't want to pulverize the mint. A scant 1 teaspoon of sugar (my usual amount for a Smash) seemed a little on the sweet side for this Brandy Smash. Is it just me? There is no bittering agent and no acid in a Smash so a little sugar does go a long way. And brandy is a softer, slightly sweeter base spirit than gin or whiskey. For those two sprigs in the shaker if you grow your own mint and have a lot, stuff two big sprigs in that shaker. Double strain if you don't want bits floating in the drink. This is a small drink - less than 2.5 ounces before dilution. So that little bitty 6 or 7 ounce Old Fashioned glass that you found at the thrift store will work well here. I am using a larger glass in the picture - it's the smallest one I have. Landy VS is not a very concentrated Cognac. There is nothing partcularly wrong with it except that it is pretty light and lacking of any funk. Dilution here is not very kind to it. For the next Brandy Smash I may try a full bodied VS, Armagnac or a nice fat de Jerez.